Acupuncture is the stimulation of specific points on the body that has the ability to alter various biochemical and physiologic conditions and help the body heal itself. Used successfully for nearly 4,000 years on animals and human beings, it is one of a variety of therapies that Stone Veterinary Hospital offers to support your pet's wellness. Acupuncture is one of the safest therapies available and side effects, if any, are usually minimal. Under the guidance of Dr. Karmen Couret, treatments may last from 10 seconds to 30 minutes depending on the condition treated and the method used. Pets may be treated as frequently as one to three times a week but, typically, are treated once weekly for four to six weeks. After the initial treatment period, the intervals between acupuncture visits are then extended based upon your pet's response. Most pets are seen once every two to six months for maintenance therapy. Some pets no longer need acupuncture therapy once their condition has resolved. A comprehensive physical, medical, and acupuncture examination is completed prior to initiating acupuncture treatment. It is also important for you to let us know about any physical changes that occur in your pet's health during and after all acupuncture treatments. 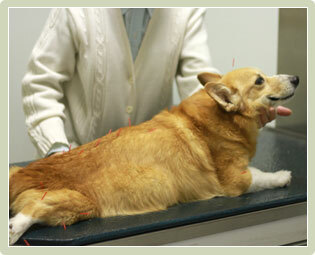 All treatments are performed by Dr. Karmen Couret, who is certified in veterinary acupuncture. Chiropractic is a neurologically based, holistic approach to animal health care and an alternative healing technique that we embrace at Stone Veterinary Hospital. Our specially trained veterinarians correct misaligned joints with specific, controlled thrusts by hand aimed at a particular joint. Improperly moving joints not only cause pain and stiffness locally, but also interfere with the functioning of the brain and the rest of the nervous system. Chiropractic is beneficial for many conditions that befall our pets. Elderly, arthritic pets can experience relief, as do pets suffering from neck, back, and leg pain, muscle spasms, nerve problems, injuries, jaw misalignments, bowel and bladder incontinence, constipation, and disc disease. Chiropractic is also important in the maintenance of health and is recommended for puppies to provide them with a healthy start in life. 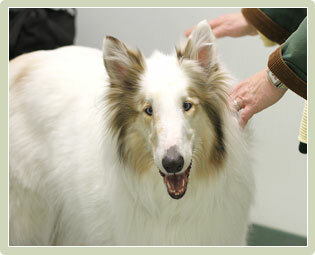 The animal patient is treated while relaxed and cooperative. Most of the pets really enjoy it, and some even fall asleep during the care. All treatments are performed by Dr. Karmen Couret, who is certified in veterinary chiropractic. Herbs are plants that contain ingredients with active therapeutic properties. Herbal approaches have been developed for the management of many conditions that currently challenge conventional veterinary medicine, including epilepsy, chronic kidney failure, chronic lameness, hormonal disorders, behavioral disorders, allergic skin disease, liver failure, and inflammatory bowel disease. At Stone Veterinary Hospital, we believe that in some cases using herbal remedies produces improved outcomes and fewer side effects than many pharmaceutical treatments. Clinical and laboratory research has shown that certain herbs can support normal function of the liver, kidneys, heart, and immune system; reduce inflammation and improve blood flow through damaged tissues; promote the differentiation, aging, and death of tumor cells; and eliminate pain. In many cases, herbal medicine can eliminate the need for chronic medications. The success of herbal treatment will vary according to the age of the pet, prior treatment history, and diagnosis.